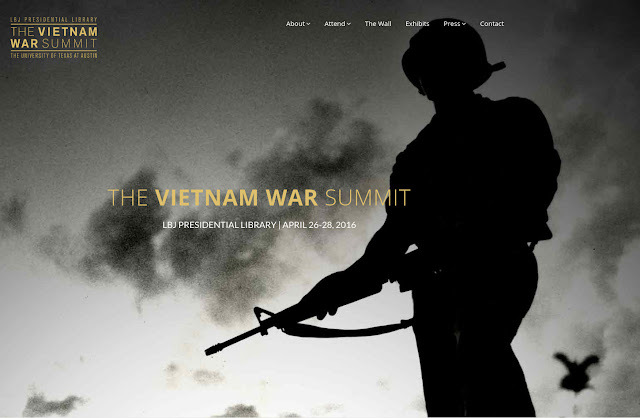 This summit on the Vietnam War at the LBJ Library in Austin will supposedly take a "substantive, unvarnished look" at the war and its role in the LBJ legacy. They have already "distributed" tickets, which means, I suppose, that it's an all-VIP kind of deal. You certainly don't want anyone asking embarrassing questions during an unvarnished look. Supposedly the events will be streamed, so I'm going to try to watch as much as I can just to see how that varnish stripping goes. I will try to blog some of it if it's appropriate. I'm hypothesizing a cascade of hypocrisy: after all, can you imagine Henry Kissinger coming clean? In Austin, Texas? No, that man is going to his grave with unimaginably heinous secrets. For the sake of National Security. For those of you who did not get invited to the Summit, the Austin American Statesman says you will be able to watch it streamed here. Commanders-in-Chief. "Historians and presidential aides discuss the roles our presidents played in the war and how their leadership affected its outcome." The Battle of La Drang. "Veterans recall the first major campaign of the war--and its bloodiest." The Afterewar. "Experts explore the physical and psychological trauma our veterans faced after the war--and continue to experience today--and the bitter, sometimes hostile reaction they received from fellow Americans." Closing of the afternoon session with City of Austin Mayor Steve Adler. At 4 p.m. there will be a Veteran Recognition Ceremony in the LBJ Library Plaza. An Evening with the Honorable Henry Kissinger begins at 6 pm. Participants include, top row, left to right: US Secretary of State John Kerry; Liz Allen, PhD, major, US Army Nurse Corps (retired); Ken Burns, documentary filmmaker; Henry Kissinger, former Secretary of State and former National Security Adviser to President Nixon. Bottom row: William McRaven, University of Texas System Chancellor and former Commander of US Special Operations Command; Dan Rather, former CBS news anchor and journalist; Nick Ut, Pulitzer Prize winning photographer; Ambassador Pham QUang Vinh, ambassador of the Socialist Republic of Vietnam to the US.